what makes a monarch burger? Monarch Burger prides itself on its ingredients. Our beef is sourced from local farmers who pasture raise and tend their animals with care. We age our beef 45 days, grind it fresh daily and hand form every burger. We start each service with buns still warm from the oven; soft, delicate, and lightly browned with butter on our flat-top griddle. One thing that sets our burger apart from others is our 'special sauce'. Don't ask what's in it... because we'll never tell. Each burger is topped with hand torn, crisp iceberg lettuce, seasoned hothouse tomatoes, and our signature 'bread n' butter' pickles. “this is the best burger in Vancouver! Vegetarian... Vegan... We've got you covered! Mushroom Veggie Burgers for all! We hand cut local russet burbank potatoes every day. We cook them three times to achieve the perfect texture of always being crispy on the outside and fluffy on the inside. They are then lightly tossed in freshly milled black pepper and sea salt. Our fries can't be beat. Want to try our take on a Quebecois classic? 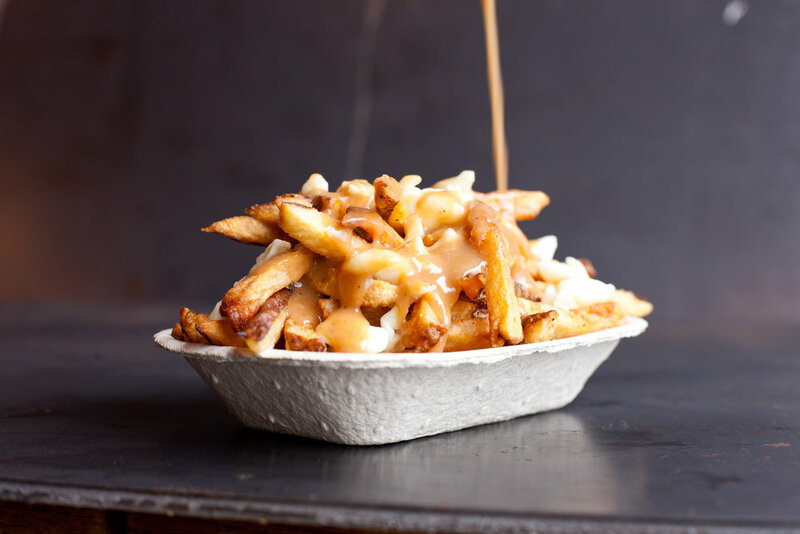 Poutine done right. Proper gravy and fresh cheese from Armstrong B.C. Kale Caesar Salad is a Monarch Burger staple, fresh local lacinato kale is hand cut as thin as possible and tossed in our house made Caesar dressing. Crunchy garlicky croutons are tossed throughout to take this dish over the top! Don't forget the cheese! Parmigiano Reggiano heaped on top for the Perfect Kale Caesar! If you're interested in hosting a Monarch Burger at your establishment we want to hear from you!